For Christmas, you're probably looking for the perfect craft. 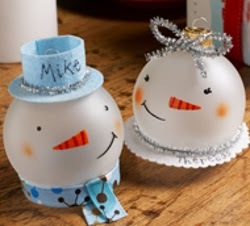 These Snowman Glass Ornaments will be a lovely addition to your holiday decor. They would also make a great gift. 4006 - FolkArt ® Enamels™ - Engine Red, 2 oz. 4008 - FolkArt ® Enamels™ - Pure Orange, 2 oz. 4032 - FolkArt ® Enamels™ - Licorice, 2 oz. Cut small donut shape out of blue felt to fit over top of boy ornament. Cut small strip of felt for top of hat. Write name with marker & glue to inside of inner circle. Glue chenille stem around hat then glue to top of ornament.